We have seen how we can come into Holy Place in the heavenly tabernacle through the cross, through Jesus who is the Way, the Truth and the Life. Just as the sacrificial lamb was prepared by the High Priest, so Jesus prepares us daily as a living sacrifice. Besides the altar of incense, in the Holy Place there is also a laver (a large bath, made of polished bronze) (Ex 38:8) in which the priests would immerse themselves to wash. This mirror surface is supposed to reflect the image of God. The word of God is our mirror (James 1:23), and when we look into that mirror we should increasingly see the reflection of His image in us. Therefore, brethren, since we have confidence to enter the holy place by the blood of Jesus, by a new and living way which He inaugurated for us through the veil, that is, His flesh, and since we have a great priest over the house of God, let us draw near with a sincere heart in full assurance of faith, having our hearts sprinkled clean from an evil conscience and our bodies washed with pure water (Heb 10:19-22). We may have thought this something we do on earth. Look again: we do it in heaven. We have access through the blood of Jesus, a new and living way, into the heavenly realms. …Christ also loved the church and gave Himself up for her, so that He might sanctify her, having cleansed her by the washing of water with the word… (Eph 5:25-26). Are we willing to submit to the authority of the word of God in our lives? The Spirit of God breathes life into the word and applies it; we surrender to it and make it the authority in our life. The logos (written word) becomes the rhema (spoken word). For the word of God is living and active and sharper than any two-edged sword, and separating as far as the division of soul and spirit, of both joints and marrow, and able to judge the thoughts and intentions of the heart (Heb 4:12). This familiar verse is not about the Bible, the book, but about the living word which addresses the issues in our life. When we look into the word; when we surrender our lives to it, God can reveal to us aspects of our life and behaviour to which we have been blind (our ‘blind self’). We see and surrender to the truth, and step into the light where the 7 spirits of God are burning, bringing knowledge, wisdom, understanding and so on (represented by the candlestick there in the Holy Place). When Jesus, our High Priest, prepares our life as a sacrifice, He removes all our coverings, skins, and masks; all our onion layers of self-protection. We stand before Him naked, transparent, uncovered; our flesh completely exposed before God. Fig leaves did not work for Adam and Eve: we need to stop trying to cover up with dead works, self-righteousness, defence or coping mechanisms, trying to meet our needs apart from God. We need to surrender. Hebrews 4:12 (which we looked at above) talks about three things: dividing, separating, judging; three layers of God’s dealing with us. 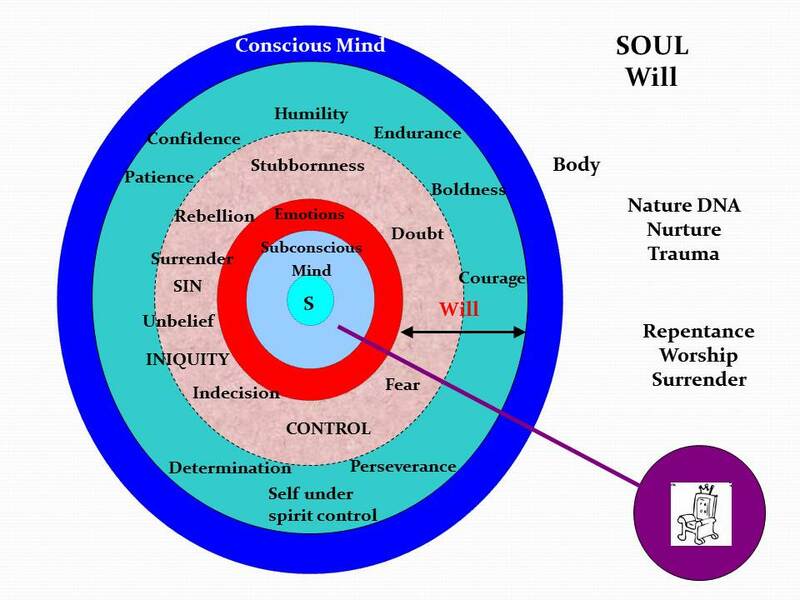 The division of soul and the spirit is about our behaviours (transgression); but there is a deeper level, our thoughts and intentions, our motives (sin); and deeper still, the bone and marrow, the root or source of things in our lives (iniquity). We are a 3-part being: spirit, soul and body. God is a 3-part being: Father, Son and Spirit. This is because 3 is the number of government. Everything operates in threes, even transgression, sin and iniquity. seed line – our DNA genetic record, which may contain reptilian seed (Cain), Nephilim seed (angelic/human hybrid) or righteous seed (Noah). We can deal with both trauma and nurture by surrendering; by entering into the realms of heaven to present ourselves as a sacrifice. We allow ourselves to be skinned of all masks, coverings and layers; self-righteousness, religious coverings, denial and projection; self-protection, coping and defence mechanisms. We will see how to deal with our nature (blood line and seed line) later in this series. 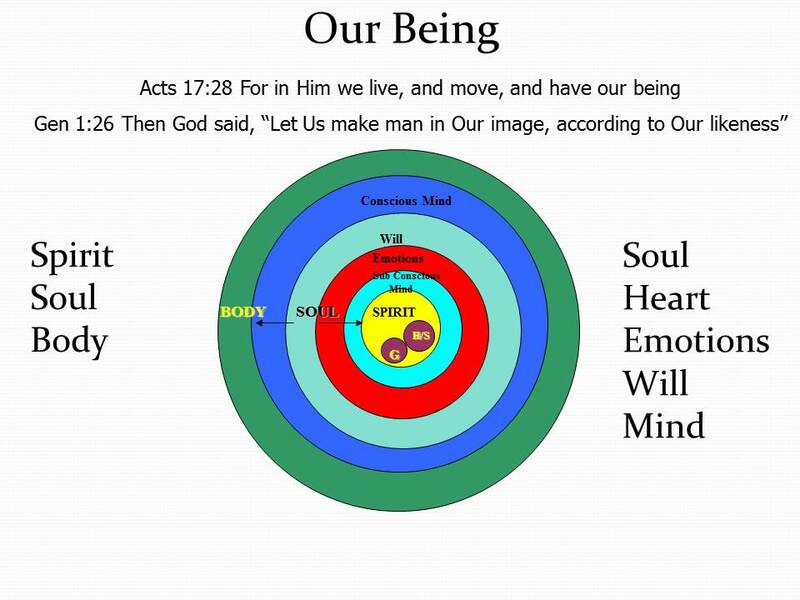 We are made in the image of God, spirit, soul and body. Our spirit is where the Holy Spirit is resident, with the mind of Christ, the glory of God and the heart of the Father. When we surrender our spirit and the throne of the government of our life to God, then our spiritual senses are activated to express God’s glory through us to the world around us. Our spirit is surrounded by our soul. 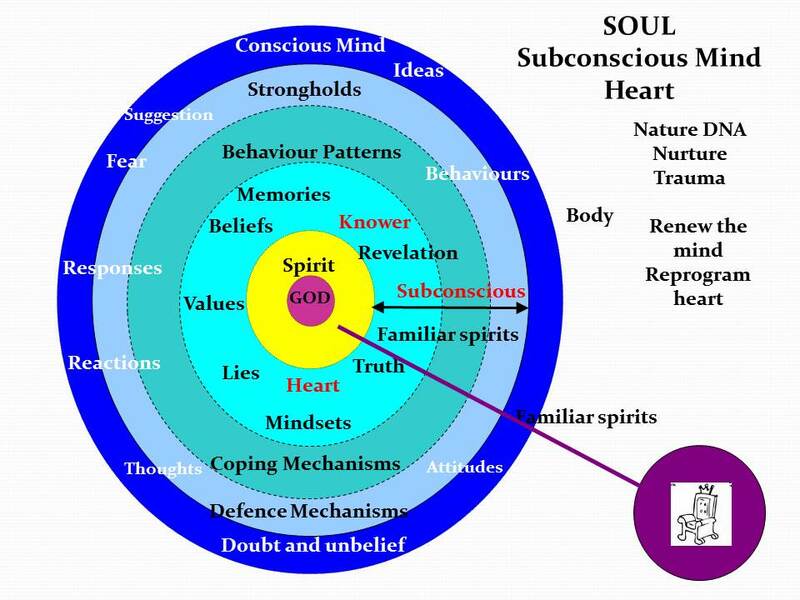 Our conscious mind is the outer layer of our soul, the connection between it and our body. We can have lies masquerading as truth in our subconscious (at Freedom we call it our ‘knower’ because it is where we know that we know that we know things). But just because we ‘know’ something does not make it true. Our strongholds defend our right to believe lies. We need them demolished so that lies can be replaced with truth, reprogramming the mind and renewing the heart. I do not know anyone who grew up with the ideal of perfect love, esteem, worth, value and security. We have all had unmet needs which we tried to meet through imperfect people, who inevitably disappointed us (God is the only one who can meet our needs). 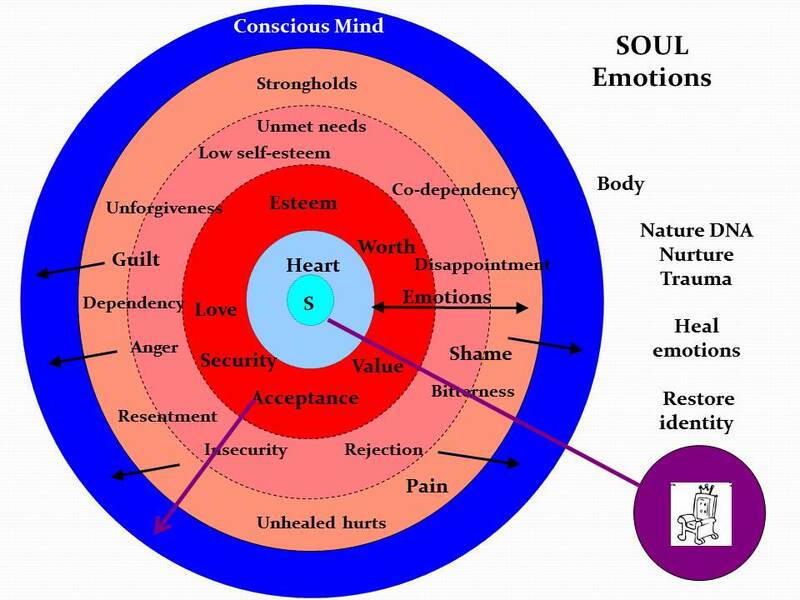 Emotional damage eventually comes out through our conscious mind and expresses itself in our behaviour every day. We have lived under the rule of things that shaped our lives. If we present ourselves to Him, God heals and restores us. In our will, sin and iniquity have caused stubbornness, doubt, fear and so on. As we surrender, as we daily present ourselves as a living sacrifice, God replaces those with patience, confidence, humility, endurance – all the positive attributes you see there. If we pursue transformation, God deals first with our behaviour. And if we persevere, beyond that there are still motives and roots that He will begin to address. 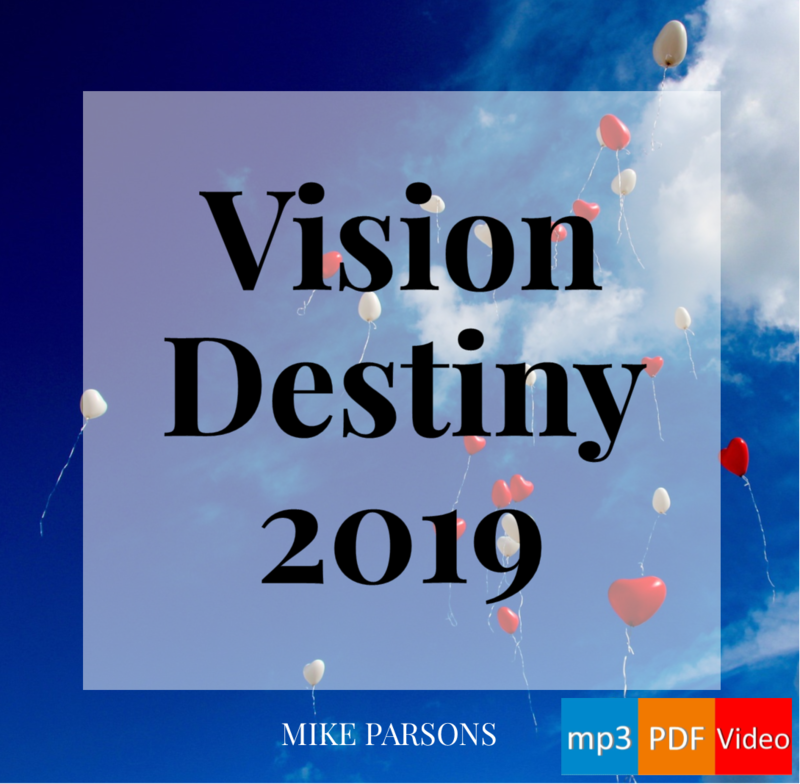 Transformation 20-part audio series with slides (in which Mike goes into much more detail in each session than is possible here, though this post has been drawn from his notes for session 6). Question, when I offer my self as a living sacrifice, or do any repentance… Do I have to do it out loud or can I meditate and process all of this internally! There is value in speaking aloud, because words are creative and can call forth the visible from the invisible. However, if you are in an environment in which it is not possible or convenient to speak aloud, certainly you can do these things silently, internally. Blessings- Jeremy. Thanks Jeremy! Appreciate the quick answer, can express how bless I’m by you n the guys at freedom!